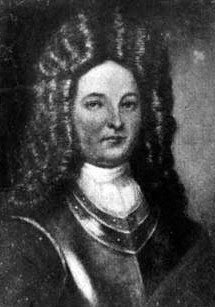 ...Rhet was colonel of the Provincial Militia, receiver general of the Lords Proprietors of Carolina, surveyor and comptroller of customs for Carolina and the Bahama Islands. When in command of the colony ships, in 1706, he repelled a French and Spanish squadron [an attack on Charleston], and in 1718 he captured the famous pirate, Major Stede Bonnet, after a brilliant but bloody encounter at Cape Fear. Bonnet's ship, the Royal James, and Rhett's flagship, the Henry, were both aground, careening in the same direction. The deck of the pirate ship was protected, but the Henry's deck was in full view od the pirates, and was swept by cannon and pistol fire for five hours. 'Rhett was,' wrote McCrady, 'of violent and domineering disposition, but his repeated and signal services to the colony demanded its gratitude and respect.'" In the fifty seventh year of his age. Rest in peace, Colonel Rhett.